Flexible working, work-life balance and work-life integration: Why it's all about trust. Flexible working means lots of different things to different people, companies and managers. For some, allowing their people to come in ten minutes later is super flexible - to other companies, ones like ours who work 24/7 365, it’s maybe the other end of the spectrum. And it’s not just about different companies, it’s also departments, managers and roles. I think if we all thoroughly understand what ‘could be’ then we will make true flexible working a reality. Let’s start with what it means to me and Reward Gateway. 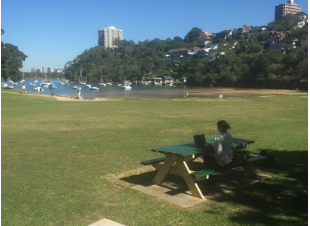 I’m writing this in a bayside park called Sirius Cove - truly - it’s the middle of the day and across the park, on another picnic bench, I see someone working on their laptop - I’ve taken her photograph to prove it. Her name is Katie and she’s a mortgage advisor. She does her admin and phone calls in the park. She splits her day and works where she’s most effective. She usually works 6.30 p.m. until 9 p.m. with clients in their houses and sometimes she needs to connect with other people in the office. But when she’s doing administrative work, or calling customers? She can do that from anywhere. So why not do it outside on a sunny day and get some fresh air? I’m based in Australia - we’re 30 people out of 330 - the rest of our team is predominantly in Europe - either 7 or 9 hours behind us, or in Boston, 14 hours behind us (9, 11 and 17 hours behind for half the year!) There isn’t one ‘traditional’ working hour that we share between Australia, the UK and US - and there’s literally one hour overlap in Bulgaria - but only in their summer and our winter! I’ve lived here for 8 years and I still find it mind boggling. It’s why, in our interviews, we explain the concept of “work-life integration” at Reward Gateway: We expect you to have a life and live it - it’s what makes you the great person we want to hire. What it means in reality, is that some people in our organisation work a lot of early mornings and late nights. And I applaud them, as we couldn’t function if that didn’t happen. In the old days, one was expected to put in the hours, whenever we needed to and not complain, 16 or 18 hours was not out of the ordinary. Our work life and home life was really separate. I realised, when my son was growing up that something needed to change, so I forged the way with flexible working. I still feel, 20 years later, that I’m having to justify to managers why it’s ok to trust their people to make great decisions about how, where and when they work. 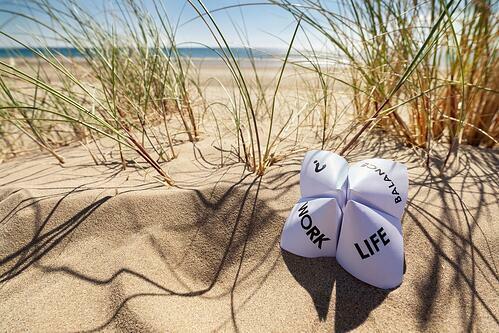 It’s no longer about work-life balance. It’s about work-life integration. I expect people to be able to bring their whole selves to work as I believe they enjoy their job more if they can do that (and we benefit as a company). It’s one of the ways we strive to keep our employee engagement front and centre. Our people have children, partners, dogs (or cats, but most of us at Reward Gateway seem to be dog people!) and hobbies as well as work - and for a person to really function there needs to be balance. So therefore, my expectations as a leader are a little different. 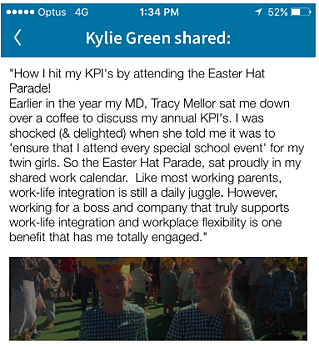 Here’s a great example from Kylie Green, our Australian sales director …. And also, mother of twin girls, wife, interior design and renovation nut, as quoted on LinkedIn. We have two athletes in our office who represent their country - Australia and New Zealand - I expect them to work around that too, to follow their passion - as well as be great at what they do at work. And if it’s about location, we have one guy, Miguel, who works in Portugal - because that’s where he lives. And believe me when I say that no one is peeping over his shoulder to see what time he opened his laptop. We trust our people, and we know they’ll work hard. That’s what happens when YOU work hard at engaging your workforce. We don’t need to be so super rigid. I think the main thing is that presenteeism isn’t the way forward - I don’t have to see you to know that you’re doing a great job - on the contrary, you could be doing your online shopping or playing on Facebook sitting right opposite me and I wouldn’t know. But the truth is, if you can’t be trusted to do your job, to deliver your objectives and to make our customers happy, then you shouldn’t be working for us. That’s the way you should be treating your people. And for anyone with responsibility for people: We shouldn’t manage the majority because of a couple of people who might take advantage. If someone isn’t doing their job well, you’re going to find out, no matter where they are. Life isn’t 9-5 in a global company. Some days you’ve literally set the alarm in the middle of the night to connect with someone on a different continent. Hopefully you’re not doing it too often as you need your sleep! But sometimes it’s OK. You can take advantage of the flexibility and use your 2-hour commute to either get some work stuff done that’s been piling up and tick more off your list, or take the dog for a walk or kick a ball around with your mates or your kids. To those struggling with work-life integration: why don’t you negotiate some more frequent working from home days.? As long as you can get your work done and you’re in the office for meetings then why not take the leap and do it? 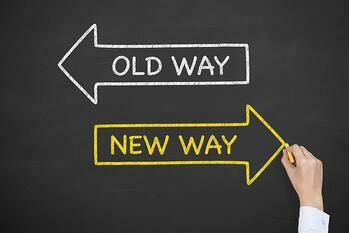 As Leaders it’s our responsibility to set the new environment for work. To make it a place where people feel comfortable talking openly about things that they need to achieve outside of work and how they can integrate it into their work life without it having to be a struggle. The choice is no longer choose work or life. It’s how to choose them both.